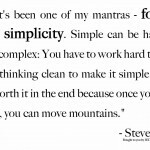 Posted by Aden Toh in Email, Web/Internet. For all you new Mac owners who have just switch over to the Apple camp, welcome aboard. In case you are exploring alternatives to the default Apple Mail app, we have put together a list of email client options that you can also consider using to manage your emails. Many of these email clients, though relatively new, are packed with contenting features and new concepts with a strong focus on increasing your productivity and making your email experience a unique one. Here’s the line up to begin with. 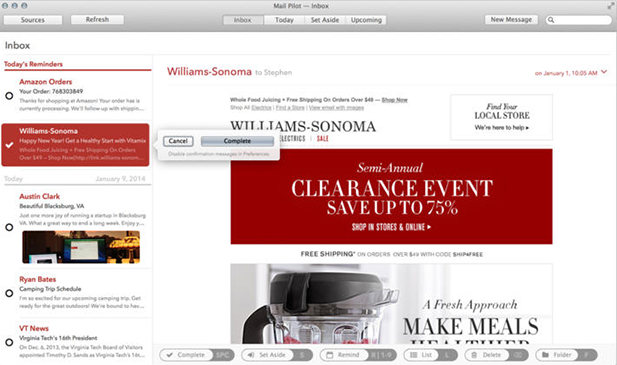 Postbox resembles the traditional and familiar Apple Mail interface with the addition of many impressive features. For social media junkies, you’ll be impressed with its integration with social media platforms like Facebook, Twitter, LinkedIn allowing you to seamlessly pull photos, access social profiles and view useful data like employment information directly from Postbox. If you are a Dropbox user, you can share large attachments by embedding links in your email that let your recipients download them straight from your Dropbox account. Evernote users can also convert emails into Evernote notes easily with Postbox. Postbox is available for purchase at $9.95. A 30-day free trial is available for download as well. Inky’s strength lies in its ability to sort and filter emails by relevance. Its smart filtering technology automatically recognize and filter your emails containing newsletters, daily deals, social notifications into smart views. Inky also allow you to add multiple IMAP or POP accounts so you can have all your work and personal emails in one common place. What’s better still, it stores all your account information securely in the Cloud. Once you’ve configured your accounts, you only need a single login to bring all your emails to any computer you’re using Inky with. Inky is free for download. 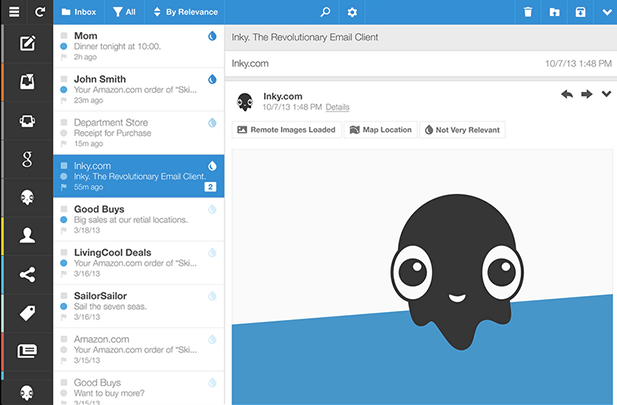 Mail Pilot takes an action-oriented approach in managing your emails. 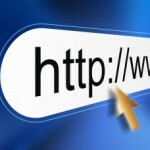 It starts with the belief that every email has an associated action that you should take. All emails have a status – complete or incomplete, just like a to-do task. New emails will default to incomplete when it arrives. Achieve inbox zero easily with the option to set aside emails that you want to work on later so it will not clutter your inbox. Mail Pilot is also the only email client in our recommended list that has a version for iPhone + iPad so you can have the same productive experience as you have on your Mac. 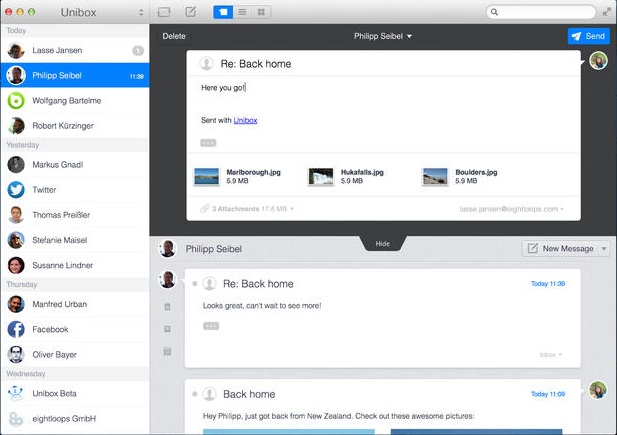 Mail Pilot is available on the Mac App Store for $9.99. The iPhone + iPad app can be downloaded for $9.99 as well. 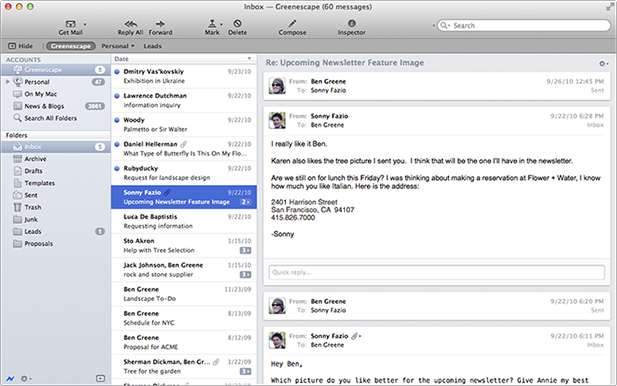 Unibox is a person-centric email client that organizes your email messages by person. The concept is pretty much like how your instant messaging apps work. You see all the emails you exchanged with a person arranged neatly in a unified list making it feel like a natural conversation. One particular feature we like about Unibox is its attachment consolidation view. In this feature, you have all the file attachments that you’ve ever exchanged with a person consolidated in a beautiful grid or list view, just like a regular folder on your computer. It’s definitely a useful tool that will save you from situations where you have to look for a single file buried under endless piles of emails. Unibox can be purchased from the Mac App Store for $9.99. Thunderbird is not the new kid in the block when it comes to email. It has been around for some time and if you were using Windows previously, you may have used it before. Thunderbird has an extensive add-on ecosystem where you can download add-ons to extend its basic functionality. Apart from that, it’s pretty much a very basic email client that does what it should do. Choose Postbox if social media is your life. 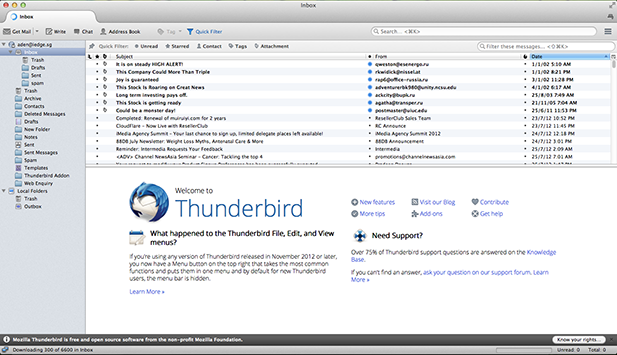 Thunderbird for Mac is available as a free download. If you frequently have an inbox overload problem, we recommend that you go with Mail Pilot that allow you tag your emails with clear actionable tasks. Inky and Unibox are good organizers as they both have unique view options that give you greater clarity through your personal and work emails. For users who’ve used Thunderbird on Windows before, you may want to choose it for that familiar feel. If you’re active users of third party social platforms like Facebook, Twitter, Dropbox, Evernote, then Postbox is without doubt your best choice. Pick the email client that best fit your needs. Try out these apps and share your reviews with us below. If you know of any other worthy alternative email clients for Mac, feel free to recommend them here as well. Good luck and enjoy exploring your Mac. 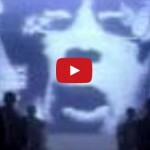 The Reason Why 1984 Was Awesome!